Enjoy your driving? Then this is the stuff of dreams – and if you simply enjoy seeing more of deepest France then take it easy and prepare to come face to face with some of her most magnificent scenery. 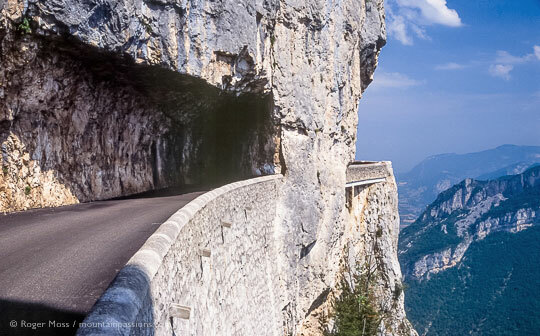 Our chosen route provides an unforgettable circuit around the heart of the Vercors Massif, a 170,000 hectare regional natural park set beside the Alps in south-eastern France. Even allowing for frequent stops to admire the amazing views you could still complete it quite comfortably in a morning, although as you’ll see, we took another approach. 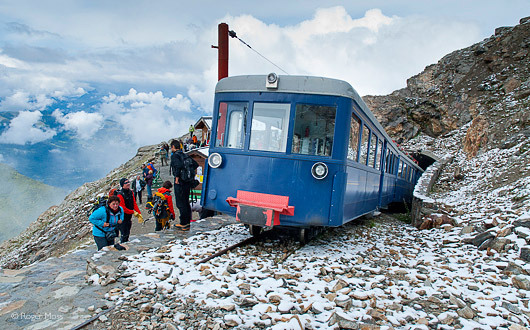 …this is the stuff of dreams; if you simply enjoy seeing more of deepest France then take it easy and prepare to come face to face with some of her most magnificent scenery. 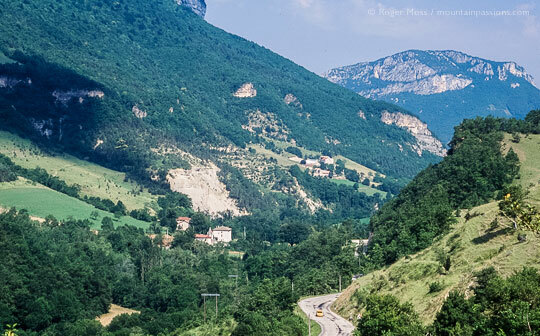 Our journey through the heart of the Vercors begins on the N532 east of the Tournon and Romans exit from either the A7 ‘Autoroute du Soleil’ or the legendary RN7 trunk road taken by generations of families heading from northern France to the Mediterranean coast on their annual ‘grandes vacances’. A few kilometres beyond St Nazaire-en-Royans (proud possessor of a huge multi-arched aqueduct, complete with ascenseur) take the D531 right turn to Pont-en-Royans, famed for its ancient riverside houses whose balconies are suspended on timber props high above the gorge of the Bourne river. 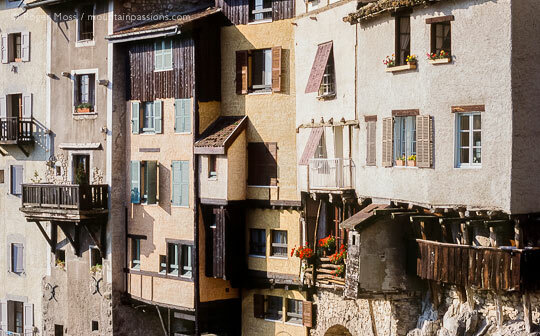 After negotiating the narrow streets of the old cloth-making town take the left fork signed D531 Gorges de la Bourne. From this point you can enjoy the classic views featured on local postcards by parking safely beyond the junction and walking back to the bridge. The road begins among wide valleys where traditional farming continues unchanged, against an impressive backdrop of a limestone massif. Things are about to change dramatically, however. 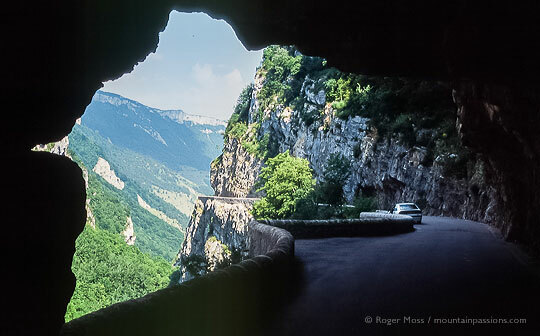 The onward drive through the Gorges de la Bourne is a truly spectacular drive and requires care and concentration, although apart from a narrow stretch leaving the village it’s more straightforward than many of its kind. Along the way it also offers surprisingly wide views of the surrounding mountains, the whole effect softened considerably by mixed woodland and plenty of other greenery. The river, too, relaxes for awhile into a broad, stony bed but eventually the road climbs and you’ll glimpse it only occasionally tumbling through dark, narrow ravines far below. 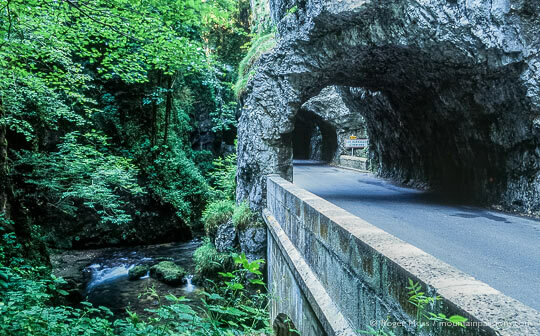 As the valley closes in the road passes through the narrow Tunnel d’Arbois blasted through the tough limestone, establishing what is destined to become a familiar pattern throughout the journey ahead. 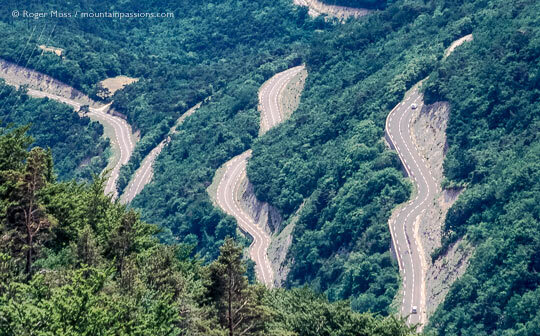 Tip: Sound your horn as you approach the many blind bends, like the locals do. If your visit follows recent rainfall then to your right you’ll eventually see the slender white ribbon of the Bournillon waterfall tumbling 300m down the sheer face of Châtelus, whose commanding presence dominates this part of the valley. The road continues towards the family ski resort of Villard-de-Lans, but we will take the tight right turn marked D255 St Julien-en-Vercors, which immediately takes us on a winding wooded ascent towards the little mountain village. On the final hairpin bend the benefits of the climb will suddenly become apparent, with sudden, near-aerial views across the whole valley (there’s safe parking beside the nearby tourist information panel). 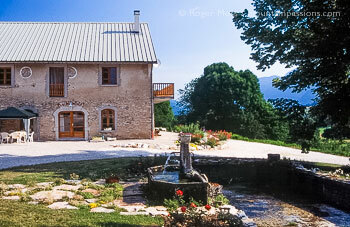 At this stage you have the option of pressing on or – our preferred option – stopping overnight at the Domaine de Piache, which is signposted from the roadside just before St Julien. From here, in addition to enjoying a warm welcome, excellent food and great comfort in a truly memorable setting, you’ll be able to tackle the remainder of the journey well-rested and in the generally clearer conditions of the early morning. Beyond St Julien the D103 begins a steady descent through beautiful Alpine-style meadows beyond St Martin-en-Vercors. In Les Barraques-en-Vercors we used to take the route signed Les Grands Goulets but this route is now closed to vehicles. Instead a 1.7km tunnel now bypasses its predecessor, which was often subject to closures due to rockfalls. See this video of driving the Grands Goulets before it closed in 2005. The next section is actually scooped out of the vertical rock face as it winds its way around the twists and turns of the gorge, leaving colossal overhangs above the road. Further down the valley near village of Echavis we cross the Vernaison river and pass a sign announcing a series of five further tunnels ahead. By this stage you can’t fail to be moved by the heroic scale of construction by which this once-remote region was opened up to the outside world back in the 1850s. Any lingering doubts will be dispelled by simply peering over the parapet beside one of the many parking spots at the valley floor 200m below. The road continues its long descent, passing through mixed woodlands to the fertile plains (home to extensive almond plantations) on the broad valley floor around St Eulalie-en-Royans, at which point we turn left onto the D54 to St Jean-en-Royans. The D76 Combe Laval road (a clearly marked left turn in St Jean) sustains all the drama of our route so far with a few fireworks of its own thrown in for good measure, including a sensational 4km stretch overhanging a 600m cliff face above the Cholet river. On the way up we pass through woodlands, emerging at a lay-by with an orientation panel, relating the historical importance of the local timber industry. Originally sawn in water-powered mills, the timber was floated down from Port-en-Royans to the Mediterranean via the Isère and Rhône. 15,000 tonnes are still produced annually. At around 1000m altitude we catch sight of the first of a series of rock arches announcing the start of the Combe Laval. The curiously-named Col de la Machine (1015m) soon follows, with more fine viewpoints from which to try to take it all in, on the descent to the ruggedly-beautiful Forêt de Lente. 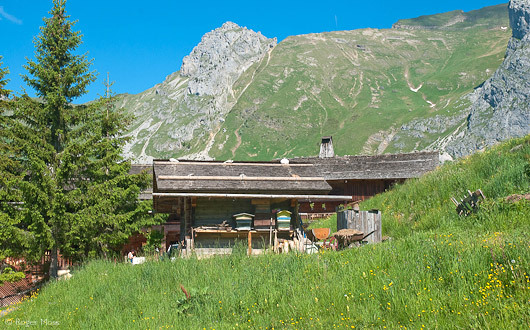 As we emerge from the forest, the small family ski resort of Font d’Urle appears to our right – ideal for a lunch break on the terrace of a pleasant café/bar. Suitably refreshed, we soon reach the Site National de la Résistance which occupies a commanding position on the Col de la Chau, a wild and beautiful hillside high above Vassieux, and recalling the heroic WWII events which brought the Vercors lasting fame. A few kilometres later down on the valley floor the D76 turns sharp right, past a prominent cemetery in which many of the martyrs of the French Résistance lie buried. In Vassieux follow the Col de Rousset signs. From here the route begins to climb once again leaving the lush plains en route to the Col de St Alexis (1333m) and the ski resort of Col de Rousset. Once again, wildflowers line the roadsides. 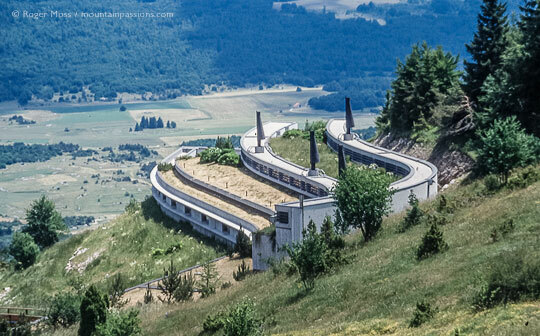 At the entry to the village take the right turn (D518) at the roundabout and turn on your dipped headlights before you enter the long tunnel through the Montagne de Nève, which heralds the final stage in our itinerary. When we finally emerge into daylight a spectacular sight presents itself, as the ultimate hairpin descent is spread out before us, zig-zagging its way down, down, 21km and more on the traditional route taken by traders from Die bringing honey and sparkling Clairette wines to local markets. At the town of Die the route is now complete, but you can now select your onward journey, either west on the D33 back to the A7/RN7 below Valence or south on the D93 and into northern Provence. Owner and Editor of MountainPassions, Roger is a journalist and photographer with more than 30 years’ professional experience producing illustrated ski and travel editorial features for magazines and location photography for travel guides, both in the UK and overseas. He regularly writes resort reviews for other ski websites and tour operators as well as ski and mountain features for newspapers and magazines worldwide. 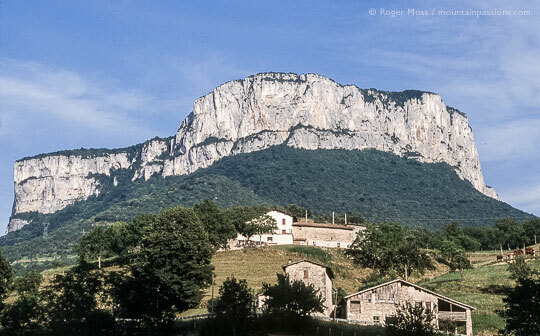 The Vercors is a natural limestone fortress, extending over 170 000 hectares between the Isère valley to the north and the Diois to the south. Over the centuries water has cut through its cliffs forming deep gorges, superb natural cirques, caves and chasms that are famous all over Europe. Its wooded plateaus and valleys shaped by generations of farmers are home to a remarkable variety of wildlife. You can explore the Vercors regional natural park on foot, on skis, or on a bike, and admire the beauty of the countryside or you can plunge into its hidden depths. 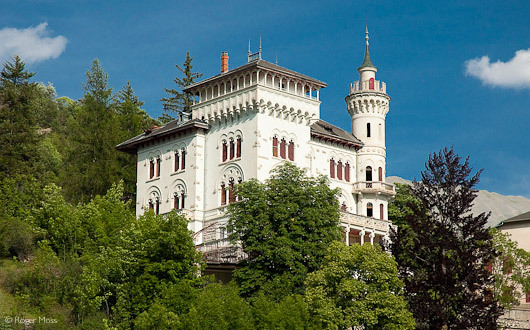 Visit the Tourism website for visit ideas and places to stay. 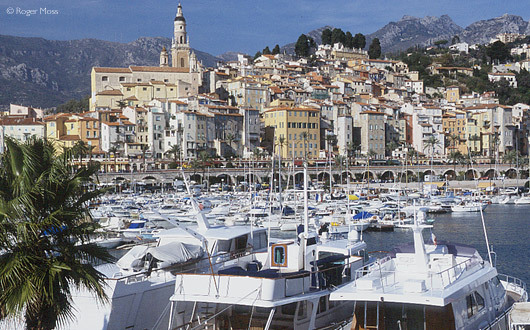 Holiday ideas, brochure downloads, travel and accommodation information. 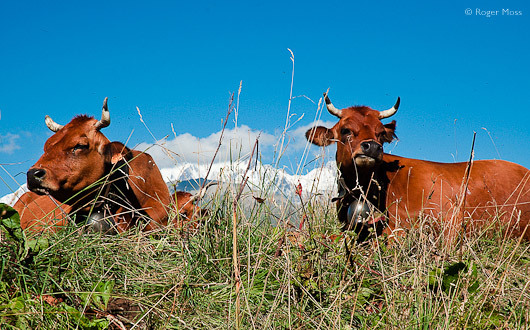 Website for the Vercors Natural Park with information about the architectural and natural heritage within the park, plus links to sites about prehistoric features and the Resistance. Welcoming Hotel Restaurant in a wonderful location. The rooms are spacious and comfortable and the restaurant specialises in serving delicious food prepared from local and organic produce.